A physical break in a weight-bearing toe or claw causes a cracked nail with an exposed nail bed. The nail can ooze, bleed or become infected. 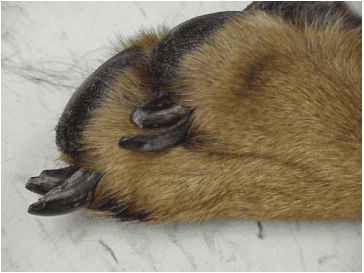 The toenail can be painful enough that your pet may stop bearing weight on the affected limb. Sometimes due to damage to the nail bed, the nail may not grow back at all or may grow back irregularly. It is strongly recommended that the nail be rechecked in 2-4 weeks to be trimmed back if needed. 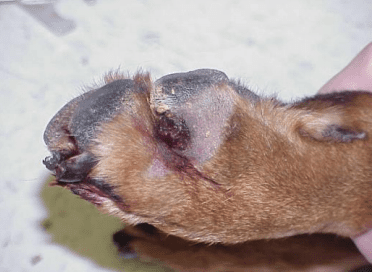 Over grown toenails / dewclaws or physical trauma. Treatment is focused on cutting the nail back to the nail bed where the nail meets the skin. This is generally done under sedation due to pain and sensitivity of the exposed nail. Once the nail bed is cut, the area is cauterized with a chemical or electrical cautery to prevent bleeding. 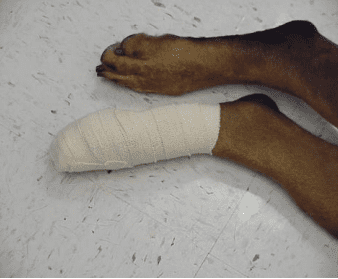 The area is cleaned with surgical scrub and the foot is generally bandaged for 1-2 days. Dependent on exposure, your pet may be started on oral antibiotics. 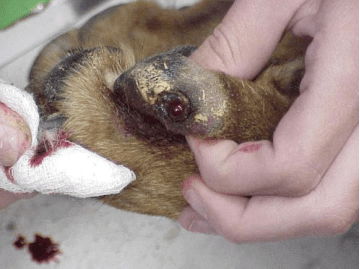 Rechecking of the nail bed is extremely important, as possible amputation is not uncommon with nail infections. Contact the clinic if your pet is still non-weight bearing on that limb or the lameness becomes worse over the next 3-4 days.